The interrelation between materials and instrument quality is of interest to all players, makers, and researchers. The quality of wood used for instruments is especially important, although it is necessary to have some way to evaluate the performance of the resulting instrument. The theme of many of this issue's articles, by 17 authors from four continents, is assessing the quality of wood and completed instruments. Di Bella, Piasentin, and Zecchinet tell us that visual evaluation of wood is an unreliable indicator of mechanical and acoustical properties. Thompson dispels a myth about the drying properties of wood. Etxebarria and Riera describe how to transform a personal computer into an acoustical measurement system, and Bell evaluated the possibility of making modal analysis a common working tool for luthiers, similar to the way that plate tuning was once used. In Part II of "Empirical tools in contemporary violinmaking", Schleske shares his psychoacoustical approach for evaluating violin tone. Sali evaluates factors important for guitar sound. Sando, Huallpa, and Arruda compare and correlate results of jury tests and acoustical tests of violins. Finally, Wang and Burroughs compare the radiated power ofa mezzo violin with standard violins, with surprising results. In addition, we recognize Gabriel Weinreich's contributions with the award of the Hutchins medal, and Fan-Chia Tao reports on the new Violin Acoustics Workshop at Oberlin University. Bissinger investigates the simulation ofviolin sounds, and Loen provides an interesting new twist on the "Messiah debate" by comparing the graduation patterns of several Golden Age Strads. Also, Loen tallies up types of strings used by elite players. The energy and creativity exhibited is this issue shows that our Society continues to be an international leader in the acoustics of string instruments. We hope that this issue helps to inform, entertain, and perhaps inspire the involvement and activity of our members. We always welcome your feedback and suggestions. Recent VIOCADEAS modal and acoustical analysis results appear to offer an interesting challenge.Can a physically reasonable bridge driving force, processed through actual experimental violin "filters" that convert it to sound, produce a reasonable facsimile of violin sound? Also, is it sufficient to tell a "good" violin from a "bad" one? In this short article, readers are offered the R-filter (in the frequency regime) for both a "good" and a "bad" violin to test this proposition. Editor's Note: David Bell graciously offers the following thoughts on developing a home modal analysis system. There is potential for organizing workshops in these techniques if sufficient interest is shown. —Ed. 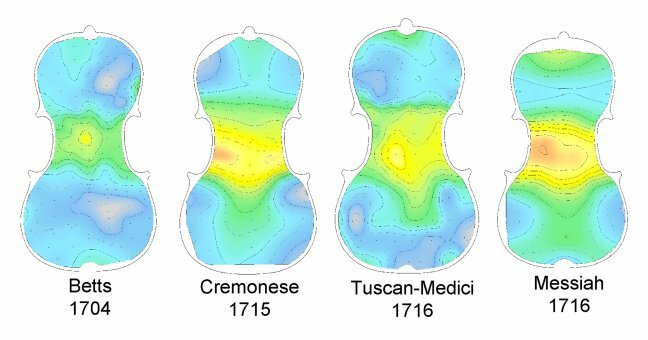 Thickness graduation maps of the "Messiah" violin show similar characteristics to those of the Betts (1704), Cremonese (1715), Tuscan-Medici (1716), and other Golden Age Stradivarius violins. Top plates are generally thin (2-3 mm), with the thickest areas (3-4 mm) occurring between the c-bouts and the f-holes. Back plates have a central concentric zone of greatest thickness (4-5 mm), in which the center of thickness lies distinctly left of the centerline in the Cremonese, Tuscan-Medici, and Kashininov violins. The thickness pattern on the back of the Messiah violin is almost identical to that of the Cremonese violin, including asymmetrical center of thickness points located more than 30 mm left of center. These characteristics do not prove the Messiah's authenticity, although such a hypothesis seems permissive because of the similarity of these commonly hidden, highly personal traits. The selection of strings for violin, viola, and cello is a problem that all string enthusiasts deal with on a daily basis. Many trade-offs are involved in selecting strings, including acoustical response, stability, lifespan, and cost. The problem is perhaps most acute for elite players who perform challenging music on the world's finest instruments. What strings do these fine players choose? Do they choose different strings for old vs. new instruments? Are the same brands used on Strads that are used on Guarneris or Amatis? Do soloists use different strings than string quartet players? How much do they mix various brands and gauges on their instruments? How important are acoustical considerations to these players, compared to other factors? Amateur and professional players, makers, repair people, researchers, and museum curators can all perhaps benefit from answers to these questions. No evidence was found of a relationship between physical and acoustical properties (density, modulus of elasticity, index of merit) and external aspects of Italian red spruce (mainly growth ring distance). Growth ring distance was determined optically for 21 planks of red spruce, cut both longitudinal and radially. Moduli of elasticity E(L) and E(R) were obtained by the measure of the deflection, under known weight, of beam-shaped samples of spruce. This paper describes a computer system for measuring and graphically representing the input admittance of mechanical devices, including musical instruments. The signal (20 Hz-10 kHz) is generated by the computer's sound card, amplified, and fed to a coil which acts on a rare-earth magnet. The magnet applies the driving force to the test sample. Signals received by an accelerometer fastened to the sample are processed using MATLAB software. Data collected using the system make it possible to evaluate the quality of xylophone bars, and to collect information on eigenmodes for violin plates and completed instruments. A frequency response function (FRF) of a classical guitar was measured. The input signal was a mechanical impulse at the bridge and the response signal was a sound pressure at 1 m from the soundhole. This resulted in a single FRF similar to the average of several FRFs where excitation was located at the different places on the soundboard. The excitation at the bridge FRF is a reliable measure of the acoustic properties of a guitar. The measured FRF showed a high degree of linearity and had a high value of the coherence function between 70 -250 Hz. The first resonant peak of the FRF is a result of interaction of the soundboard-air-back triplet. The first resonant peak showed a significant correlation with the loudness of six tones. This significant peak of the FRF can be used in measuring and modeling the guitar's response with the aim to develop a procedure for optimizing the position of braces on the soundboard of the guitar. A jury test aiming at providing subjective descriptions of sound quality was performed on a small set of violins. An attempt is made to relate the results of these jury tests with a proposed objective analysis criterion, which uses measurable acoustical parameters. The proposed criterion is based upon the spectrum of acoustical sounds from recordings of glissando runs performed on each string by a player. Glissando runs starting from the open string and spanning more than one octave were used, and recordings were made with a sound quality torso in a semi-anechoic chamber. The digital data thus obtained were analyzed on a PC using a MATLAB implementation of a constant-Q transform, which can provide a magnitude spectrum of the sound pressure at any desired constant-percentage frequency resolution. The quarter tone frequency resolution was selected. Good correlation was found between subjective quality analysis evaluated by the ad hoc jury and the proposed objective criterion. A method for measuring and interpreting the sound radiation of bowed stringed instruments is introduced. The aim is to extract psychoacoustical information from "technical" data in an instrument's resonance profiles. Measured transfer functions (L p =p/F; with p=radiated sound pressure and F=exciting force) provide the input data for calculating specific loudness and overall loudness as a function of playing frequency. Examples are given for violins made by Antonio Stradivari and Joseph Guarneri del Gesu. Although similar in their overall loudness (a quantity relevant to their dynamical potential) and their tone-to-tone fluctuations of loudness (a quantity relevant to their dynamic balance), they clearly differ in their specific loudness patterns, which seem to be useful to describe their tonal color (timbre). It will be shown that the concept that wood absorbs moisture slowly with rising Relative humidity, but desorbs moisture rapidly with falling relative humidity, was based on faulty experimental procedures. The investigation described shows that wood actually absorbs and desorbs moisture at similar rates with changing environmental conditions. This has important ramifications for violin-makers. The acoustic power has been determined from intensity measurements on three structurally different violins: a Scherl and Roth student violin, Hutchins' SUS295, and Hutchins' mezzo violin SUS100. While each violin was bowed with an open-frame mechanical bowing machine, the intensity measurements were made by scanning each side of the bowing machine with an intensity probe. One-third octave band sound power levels of the acoustic radiation from each of the three instruments as each of the four open strings is bowed show that the structurally different mezzo violin produces greater power at low frequencies when the lowest (G) string is bowed, but this behavior is not evidenced on the other strings.